Researchers from the National Institute of Standards and Technology (NIST) have shown that the electronic properties of two layers of graphene vary on the nanometer scale - not only in the strength of the electric charges between the two layers but they also actually reverse in sign to create randomly distributed puddles of alternating positive and negative charges. 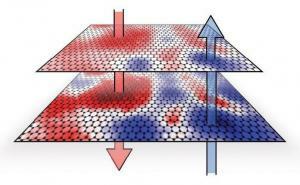 This means that bi-layer graphene (two stacked graphene sheets) acts more like a semiconductor that a single sheet. A band gap may also form on its own due to variations in the sheets' electrical potential caused by interactions among the graphene electrons or with the substrate.